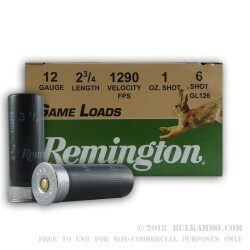 This is a 250 round case lot of the Remington small game shotshell that is a bit better at capitalizing on the abundance of pellets without being unable to kill the animal at larger distances. You don’t have the same problems with #6 shot that you do with #8 or #9 shot on small game, as the extra pellet size will help to keep wind deflection to a minimum at reasonable distances. This round is suitable for use on game birds like grouse and quail, as well as small ground game like squirrel and rabbit. 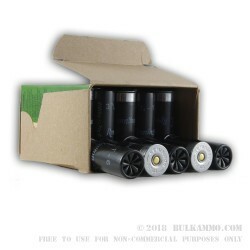 This is also good for certain other hard to hunt animals like snipe and pheasant and will easily bag you more than your standard “target load” shells that carry a much smaller shot size. You can expect a reasonable working range of about 7 yards to about 25 yards; where beyond will be difficult and closer in will make a mess of the game. 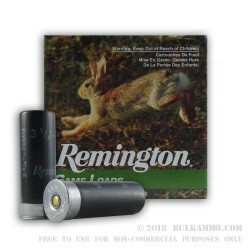 This is a proven shell offering from Remington that has been sold for decades everywhere. The 1290 feet per second velocity and the 1 ounce payload offer a unique mix of heavy patterning and fast reaction on the target with the #6 shot which is in the sweet spot for the game already mentioned.